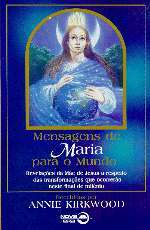 Mary's Message to the World by Annie Kirkwood has been translated to over ten languages including: German, French, Spanish, Islandic, Italian, Portuguese, Hungarian, Japanese, ... As the sources for these become available I will add them here. The book El Mensaje de la Virgen al Mundo is shown on their page at: www.robinbook.com/robinbook/index.htm under the catagory of "Espiritualidad." The Spanish version has been in stock at: Latin Trading Corp, 539 W H Street, Ste B, Chula Vista, CA 91910-4301, Phone 619-427-7867 or toll-free 1-800-257-7248, fax 619-476-1817. And for International customers you might want to contact Spanish/English bookseller CELESA, Email: magallon@celesa.es, Web page: http://www.celesa.es. The German publisher for the books is: Christa Falk, Christa Falk Verlag, Ischl 11, D-83370 Seeon, Germany, phone 49 8667 14 13, fax 49 8667 14 17. The books are: Marias Botschaft an die Welt (Mary's Message to the World); Marias Botschaft an unsere Familien, Buch 1 und Buch 2 (Messages to Our Family, Book 1 and 2); Marias Botschaft der Hoffnung (Mary's Message of Hope). Portuguese information is at: http://www.red.com.br/mvnf-14.htm. Messages to Our Family by Annie and Byron Kirkwood has been broken into two volumes and is available in German and French (see above for contact information). Instructions for the Soul, Mary's Message of Love, and the Survival Guide for the New Millennium are currently only available in the American English versions. If you are a foreign publisher or a distributor of our books and want me to add you to this list, please email me (Byron@baproducts.com) with the details of how you can be contacted or the book purchased.